Jhumpa Lahiri is a Pulitzer-winning author whose story moves from India through USA to Italy. Reetta Räty met with Lahiri in Finland. In this exclusive interview for Aalto Leaders’ Insight the author talks India, USA and identity – and reveals where she has been happiest. A bus has been standing amidst traffic between Agra and Delhi in Northern India for two hours now. I am laying in the backseat of the bus reading. I have folded my scarf into a pillow. Delhi has about 22 million inhabitants and is one of the largest cities in the world. Agra has one of the world’s seven wonders, the Taj Mahal mausoleum, which Shah Jahan built for his wife who died aged 39 during the birth of her fourteenth child. Yet being stuck here in Indian traffic does not make one think of the size of the city or its historical tragedies. The attention is drawn to the clip of Indian reality outside my window: colours, sounds, overall chaos where trucks, water buffalos, rickshaws, monkeys and thousands of human fates are visible all at once. Incredible India where traffic is never just a line of cars. Magnificent India where it is always worth carrying a camera, and a book. What I have in the backseat of the bus is the American-Indian novelist Jhumpa Lahiri’s most recent book Lowland. Jumpa Lahiri is a writer awarded with the world’s most prestigious prizes. Her most recent novel Lowland was just published in Finnish (Tulvaniitty, Tammi 2014). This is why Lahiri is currently sitting in the publisher’s auditorium on Korkeavuorenkatu street in Helsinki, reciting a section that describes the book’s two brother protagonists. Since childhood Subhash had been cautious. His mother never had to run after him. He kept company, watching as she cooked at the coal stove, or embroided saris and blouse pieces commisioned by a ladies’ tailor in the neighborhood. Lahiri is in Finland with her husband Alberto Vourvoulias-Bush and her children Octavion (b. 2002) and Noor (b. 2005). The children are sitting on the front row of the auditorium as her husband snaps photos with an iPad. The audience includes reporters, authors, avid readers and Minister for Foreign Affairs Erkki Tuomioja. Lahiri appears exactly as attractive as in the photos within the covers of her works. Dark hair, matte skin and a narrow face. She is smaller than I thought, and does not do grand Italian gestures or talk in an exaggerated American style. Lahiri talks to the crowd about the events of Lowland that take place within the naxalite insurgency of 1960s India. One of the brothers in the book ends up in the United States, and no event takes place without some psychodrama related to family relations. The power of Lahiri’s narrative lies in her ability to depict relations between cultures and families in a particularly recognizable manner. It is rather evident that the experiences derive at least partly from her personal life story. 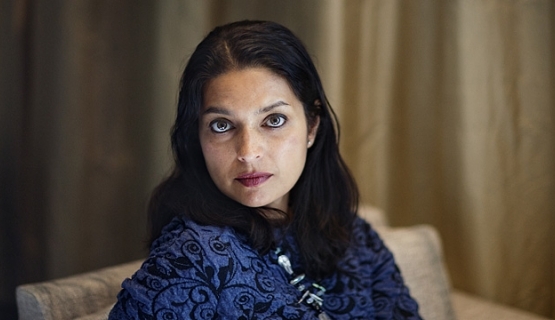 The story of Jhumpa Lahiri takes place in India, the United States and these days also Italy. Lhiri is 47 years old. Her parents are Indian, who moved to the West already in the 1960s. The author herself grew up on Rhode Island on the US East Coast. She received a Pulitzer prize in 2000 for her first short story collection Interpreter of Maladies, which is mainly about Indians who have emigrated to the States. Such as Lahiri’s parents. “My childhood felt very heavy”, Lahiri says and looks me straight in the eye. We are sitting at the cabinet of a hotel in Helsinki a couple of days after the publisher’s event. Lahiri drinks green tea. She has a serious basic expression, even timid. Yet her speech is direct and confident. The heavy feel of her childhood stemmed from the fact that Lahiri is American and Indian, but not at home in either country or culture. Her family had moved to the US, but she felt like her parents did not come to terms with their decision. Elder of two sisters, Lahiri did not know what was expected of her. Should she be Indian, American, or something else? Lahiri’s father worked as a librarian at Rhode Island University and her mother researched Bengali literature. America had so much more of everything than India did, but only in material terms. “I was out of control in an existential way”, Lahiri says. Her parents missed India, but at least they had acquired an identity: the identity of an Indian. The daughter was a complete in-betweener. Lahiri is not agitated but she talks intensively. The conflict of her childhood is clearly a matter she has processed thoroughly. When she was younger it was hard to put into words. It was a vague, dark feeling that made her feel homeless. Something was missing. But what was it? Being an immigrant child or child of immigrant parents is not all that peculiar, especially in the US. Lahiri reveals how sceptical her parents were towards the United States. Yet it was the culture of her schoolmates and friends, it was her life. Lahiri’s words and writing give the impression that not only was she slightly confused as a young person, but also unable to explicate her emotions. Only becoming a writer made her an interpreter of these feelings. The tone of the books is often hard-edged, yet very prosaic. Lahiri manages to describe the feelings of a migrant or a person living in the “wrong” place as an outsider, for she is now a narrator instead of the experiencer. Lahiri manages to describe the feelings of a migrant or a person living in the “wrong” place as an outsider, for she is now a narrator instead of the experiencer." The narrator’s voice is strong, as it conveys thoroughly experienced emotions. When Jhumpa Lahiri was young, her family visited Calcutta along the Ganges River on a regular basis. Lahiri is particularly explicit when she describes Calcutta, and confident, too. She is clearly describing familiar streets, habits, food, a way of life. When it comes to Lahiri’s works, they often revolve around a yearning for life instead of one. So what does an Indian living in the United States yearn for, exactly? What is she missing? Indeed. The colour of the sky. That is also different in India, and it cannot be purchased from ethnic shops, even if you lived in America, where money buys anything. Lahiri sighs and addresses the subject of her parents again. The way of life - what about it? Isn’t United States THE country for all kinds of people, all possible cultures? “Well, it is a place of all kinds of people and things, BUT”, the author says and highlights the last word, “compared to what my parents were used to, it was a much more isolated kind of life”. In Calcutta, Lahiri’s mother lived on a hectic street in an apartment building with neighbours and relatives above and below, side by side. Instead of exotic, Lahiri’s India is communal. Of course America has citizens from numerous countries, but they have locked themselves behind their own doors. According to Lahiri, another difference between America and India has to do with people and relationships. And an Indian family celebration is not simply a celebration, but a force that holds families together. Discussions about India always include the notion of poverty. Extreme poverty. This case is no different. But with Lahiri there is no sense in lamenting India’s poverty. Instead, we ponder how it shapes the outlook of a person living in India, perhaps even more than religion, cultural traditions or, say politics, do. “In India, even if you are living a comfortable life, like that of my relatives, you are aware of poverty”, says Lahiri. In India poverty is always visible. This was another difference that Lahiri perceived in her childhood home. Her parents had seen Indian poverty from up close, the end of the Second World War, and endless political chaos. Her father was born in 1931 and her mother in 1939. Lahiri says that her father in particular was bothered by the ignorance of Americans towards suffering in other parts of the world. This is how many post-war generations feel in other parts of the world, too. Except that in Lahiri’s parents’ world the memory of a lack of everything is not history, but geography. India is a place across the sea, a reality at this moment. It can be accessed by plane, if one wishes to get on it. Despite all the longing and scepticism Lahiri’s parents did not move back to India. Why not? “No. They didn’t go back”, Jhumpa Lahiri says and finishes there. The bus trip from Agra to Delhi is still advancing at a very slow pace. The driver thinks a truck may have broken down on the road. A police officer arrives on the scene, but is unable to do anything. We are stuck. A group of water buffalos is trying to get in between cars and buses. Monkeys are hanging on the edge of a stonewall, and one of them has a plastic bag over its head. There is a rickshaw with six passengers and a baby. A bunch of young men lies on mattresses on a truck. A barber has established a business on a street corner: a chair and a mirror. Children are waving, men are winking and whistling, and the majority of women are dressed traditionally in saris. I am reading Lowland – events have now moved from Calcutta to the US. Lahiri has comprehensively researched the history and motives of the Maoist naxalite movement. She says that she has, in fact, been working on the novel, for the duration of her writing career. The story was sparked by a report by her father on the actual events of his hometown Tollygunge during the time of the revolution. She wrote one piece on the most tragic events years ago and returned to the theme later, when the story had developed and she had interviewed a number of former Maoists. The historical events provide shape for the work and a particularly interesting read for a trip in India. Nevertheless, more grand than physical places in Lahiri’s texts are human relations. That was the day she told Drew the truth about her mother. That she has left and never returned. – – She told him how she used to sit inside the closet where her mother had kept her things. Behind the coats she hadn’t taken with her, the belts and purses on hooks that her father hadn’t given away. She would stuff a pillow into her mouth, in case her father came home early, and heard her crying. – – Drew held her as she listened. I’m not going anywhere, he said. The night is getting darker in the bus and reading is becoming difficult. The driver says that traffic is getting heavier as after nine pm also trucks are allowed on the road to Delhi. I close the book, sit up and look out of the window. A truck driver next to me is lifting his hands to indicate that indeed we have no choice but to wait. His car is painted turquoise and we are both on the verge of laughing, for India really is crazy. I tell Jhumpa Lahiri in Helsinki that from a Finn’s point of view India is mostly mind-blowing. When Lahiri speaks of India she does not speak of the mystical East where people believe in reincarnation and that time is cyclical. She does not speak of religion, arranged marriages or Hindu temples. She does not draw dramatic lines between the East and West. Perhaps because both are so familiar to her that they do not appear to be opposites. How do you feel in India: a foreigner or at home? During her time at school people were baffled by her trips to India. To them India equalled poverty, misery and beggars. What is India to a person who considers it almost a home? What does Lahiri think of it? “There are things in India that I don’t experience in other parts of the world but in India….”, Lahiri starts and stops to ponder for a moment. It is an exceptionally warm Saturday for April. A silent Mannerheimintie is visible from the hotel cabinet windows. The author should head back to Rome today, but she has decided to inquire if she can stay for a day longer. ”This is my first time in Scandinavia. It looks like a lovely place, I would like to see a bit more of it”, she says without any particular attempt at flattery. Lahiri has answered all the questions during the interview so calmly and analytically that when she suddenly uses a superlative, and on happiness of all things, the listener slightly flinches. The happiest years of my life. That sounds beautiful. For the last couple of years Lahiri has lived in Italy with her husband and two children. Now she says that it has been a happier time than ever before. Freedom. A word like happiness that resonates beautifully when pronounced in a sombre and definite way. Lahiri began to study Italian years ago. Language is a valid reason for a change of scenery and perspective. Lahiri is currently writing a non-fiction book in Italian. In previous interviews she has stated that language and writing feel like a home, when nothing else in the world does. But now another place besides her desk feels like home. Rome. These are big words but they do not sound overblown against the backdrop of Lahiri’s past. To feel alive in a new way. This is an enormously wonderful feeling, and as with Lahiri’s texts, it is relatable, even if one has not just moved to Rome. A new country, new culture, or a new life situation after a crises. Once you notice the colour of the sky again, the dreams you wish to carry on, the taste of red wine. The stance shifts from self-reflection to new horizons.